Excerpts of Marlin Strand’s remarks below about Hanssen’s Valdres March, the Valdres region of Norway, and the Hardanger fiddle (March issue of MVCB Newsletter) prompted me to ask a friend, Ross Schipper, to describe a Norwegian folk dance, Valdresspringar, and music from the same region. Ross, who plays the Hardanger fiddle, also teaches Norwegian and Swedish folk dances with his wife Linda Brooks in the Washington area. Ross’ remarks follow excerpts from Marlin’s article. 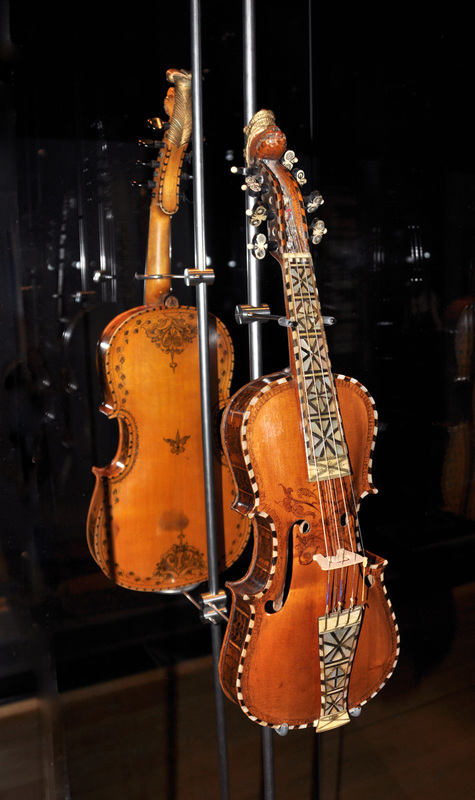 Often called the national instrument of Norway, the Hardanger fiddle has special features that differentiate it from a normal violin. Like the violin, the Hardanger fiddle has four strings that are bowed. However the Hardanger also has four or five strings that are not bowed. These strings run under the fingerboard and vibrate sympathetically with the notes being played on the strings above. 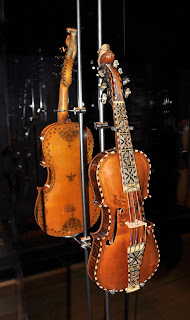 The bridge of the Hardanger fiddle is also flatter (less curved) making it easier for the player to bow two strings at once, which is done most of the time. Between the double stops and the resonance of the sympathetic strings, the Hardanger fiddle has a very full and ethereal, perhaps even mystical and unearthly, sound. You can almost see the trolls and huldre-folk dancing when you listen to this instrument being played by a master. There are various districts in Norway where the Hardanger fiddle is played. 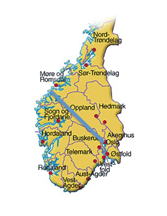 If you imagined a line drawn across a map of Norway stretching from Oslo to just north of Bergen, you would cut the country in half. South of this line, the predominant stringed instrument for Norwegian folk dances is the Hardanger fiddle, while north of this line the regular violin (vanligfele) reigns. A number of traditional dances, danced to Hardanger fiddle music in ¾ time, arise from the southern region. Three prominent examples of these traditional dances, and ones that are danced regularly in the Washington, DC area, are Valdresspringar from Oppland, Telespringar from Telemark, and Hallingspringar from Buskerud. My first encounter with Valdresspringar occurred in 1989 at the week-long Scandinavian Week dance camp at Buffalo Gap in West Virginia. Like the music from Telemark, the Valdresspringar music has an asymmetric rhythm. That is to say, the beats of the measure have different lengths in time. However, the music from Valdres differs from the music from Telemark. Telespringar music has a shorter third beat in its ¾ time measure, while Valdresspringar music has a shorter first beat. The Valdresspringar dance is also very different in character from Telespringar. While Telespringar is a very elegant dance that is often danced in a small area of the dance floor before moving on, the Valdresspringar couples typically dance one after another in a circle progressing counter clockwise around the room. It is a fast dance and the man leads his partner into many rapid changes in turning direction. Finally, the Valdresspringar always ends in a fast closed couple turn. The Valdres music is intoxicating and when the best fiddlers play, it is impossible to just sit and listen. You must get up, grab a partner, and join the other trolls dancing this fabulous dance. M.M. note: Local folk dancers also enjoy the playing of the foremost American born Hardanger fiddle player, Lorretta Kelley, a resident of the Washington area.